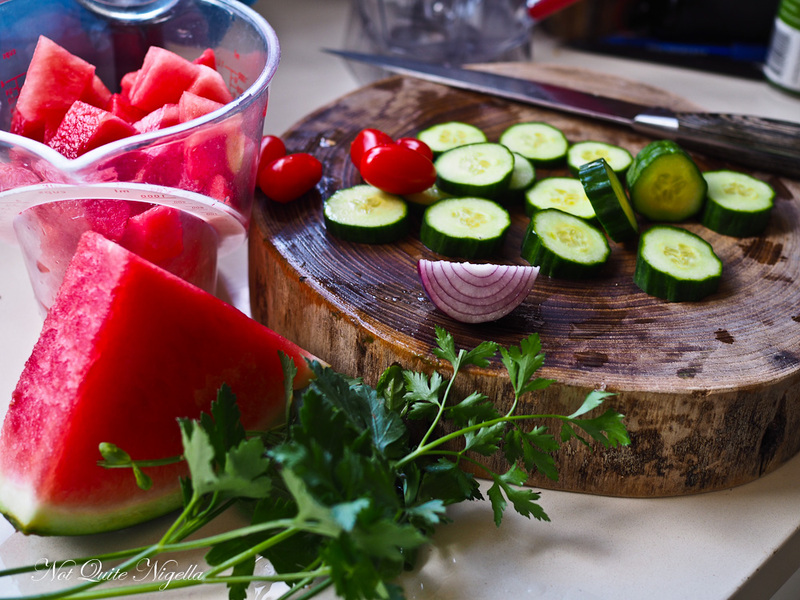 Watermelon gazpacho is a delicious chilled soup perfect for summer. 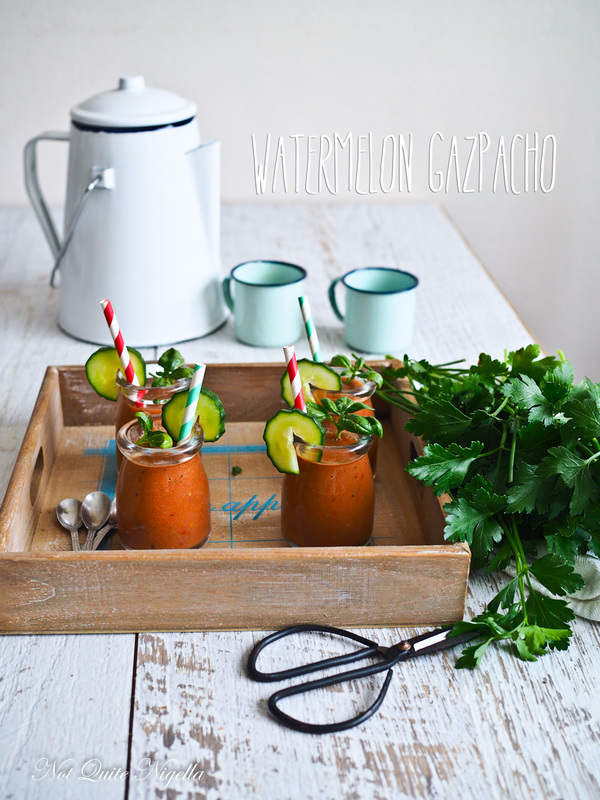 The watermelon gives gazpacho a smoother, slightly sweet but delightfully refreshing quality. 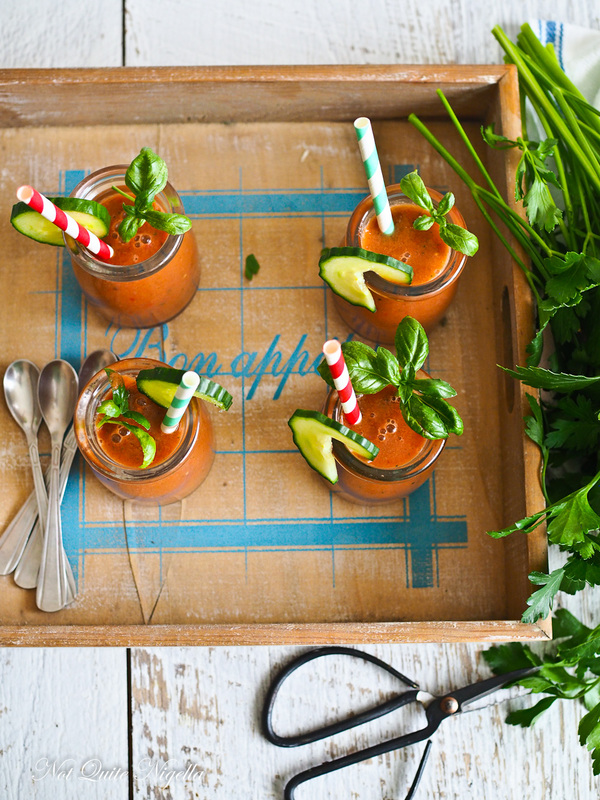 Sip this on hot days or on days when you just want to spend 10 minutes making dinner! I first tried this dish in Sonoma County, at the gorgeous Fairmont Sonoma Mission Inn & Spa in California. The restaurant there is a wonderful fine dining establishment and they brought out a watermelon gazpacho as an amuse bouche. It did its job perfectly, the gazpacho's flavours bouncing around my mouth. For those of you that might be concerned about the sweetness of watermelon in a soup, I promise that it's fine. It actually doesn't really taste like watermelon. It just imbues it with the refreshing quality and makes it less thick and acidic than other gazpachos. Truthfully I don't really like gazpacho, it's a touch too acidic for me. I remembered to give this watermelon gazpacho a try when I had an enormous watermelon that I needed to use. We were going away for the weekend and I was a bit worried that it wouldn't last til we returned. Sometimes those enormous beasts are best suited to a larger household. I thought that this was the perfect opportunity to try it. Except I didn't have a cucumber. I messaged Nina who I was seeing the next day to see if she had a spare cucumber. "I did but I just ate it," she replied. "I'll get one tomorrow," she added. As for the soup, it was a cinch-done and dusted in less than 10 minutes! And perfect for a hot summer's night. So tell me Dear Reader, do you like gazpacho? What do you think of the idea of watermelon in it? And what do you eat a lot of during hot weather? Step 1 - Process all ingredients together. Taste for seasoning, this will need both salt and black pepper. Serve with diced avocado chunks.